Bulgur or Burghul as called in Lebanon, is a cereal food made from several different wheat species, but most often from durum wheat, sold parboiled, dried and partially de-branned Bulgur is a whole grain. Bulgur is sometimes confused with cracked wheat, which is crushed wheat grain that has not been parboiled(click here for the detailed Wikipedia article and nutritional values). It comes in coarse or fine and it is used in many local dishes. Bulgur is very easy to cook and to accompany a lot of ingredients. It works well with meat as well with vegetable based assortments. 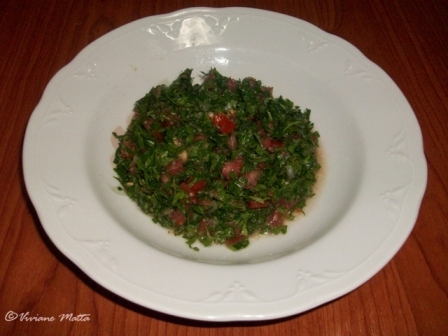 The most famous dishes that use Bulgur are Tabbouleh and Kibbeh. In Tabbouleh it is used in a small amount to add a certain mushiness or crunch to the salad, depending on how it is used. As for Kibbeh it is used to create a paste with the meat and to form a certain consistency. Also Bulgur is used as a main ingredient in local Lebanese dishes such as Bulgur Betfeen (Bulgur with meat chunks and chickpeas) and Bulgur with tomatoes. It can also be associated with potatoes to form a potato Kibbeh, which can be filled with a mix of ground meat and onions and cooked in the oven. Another vegetarian version is made by mixing potatoes, onions and bulgur. It is usually topped with olive oil and accompanied by several vegetables on the side (tomatoes, cucumber…). It can replace rice in making Mjaddara, a sort of pudding like Lebanese dish based on lentils. It is usually served with a salad or tomatoes and pickles. Bulgur is high in fiber, low in fat and sugar. It is a very nutritious cereal, rich with proteins and vitamins. Read more about it here.